In art institutions across the globe, time machines and investigation rooms exist behind closed doors. Dusty artworks go in and come out looking centuries younger; artists' secrets are brought to light; and hidden, unfinished images emerge from behind famous compositions. Every week, we'll peek beneath the microscope and zoom in on the art of preservation, where art meets science and just a little bit of magic: this is Conservation Lab. How do you play an old record without putting a stylus to it? For a long time, you didn't. In our museums and libraries, any musical, ethnographic, or experimental content captured on fragile recording media lay dormant, untouched, and in danger of being lost forever. Around 15 years ago, when Carl Haber, a physicist at the Lawrence Berkeley Laboratory in California, heard that places like the Library of Congress were facing this problem, he decided to test whether the microimaging tools he used in his research on radiation could capture the details of the grooves on a record. It worked, and the images could then be translated into audio with specialized software. This system, now called IRENE—which stands for "Image, Reconstruct, Erase Noise, Etc." and references Haber's first experiment with a record of "Goodnight Irene" by The Weavers—was recently used to extract audio from a mysterious set of glass-base, lacquer records from the University of Alaska Fairbanks (UAF). Two individuals speaking the extinct native Alaskan dialect of Attu surfaced from the deep, singing old folk songs of love and loss. The records were part of a large collection of works from the late anthropologist Dorothy Jean Ray, who was known for her ethnographic studies of Alaska's indigenous populations. The collection was given to the Alaska and Polar Regions Archives at UAF in 2013, and the four lacquer discs were put in the care of the university library's Oral History Program. Program staff know that any time you put a stylus to a record, it causes damage to the grooves—so trying to play them was out of the question. All that was known of the audio was the little that could be deduced from the notes on the labels: They were recordings from the 1940s of a dialect of the Unangam Tunuu language, from the now uninhabited island of Attu, the westernmost island in the Aleutian chain, and included conversations and songs—for example, "song sung by father to child upon return after long absence" and "song sung while traveling by canoe." Thanks to those few but intriguing fragments of information, the library was able to secure funding to send the records to the only lab in the United States that offers IRENE's capabilities to the public: the Northeast Document Conservation Center (NEDCC). After capturing detailed images of the grooves through optical scanning, the NEDCC's audio preservation specialists ran the data through software that translates the images into sound. Meanwhile, Leslie McCartney, the Curator of Oral History at UAF, tracked down a Mr. Moses Dirks, a native speaker of a similar dialect from the Aleutian Islands. Dirks was able to provide translations of the audio, and identify the speakers as Parascovia and Mike Lokanin. With a name in hand, the curator was able to piece together the Lokanins' life story. They were among the 45 residents of Attu who were captured by Japanese forces on June 7, 1942, and sent to a prison camp on Hokkaido Island. 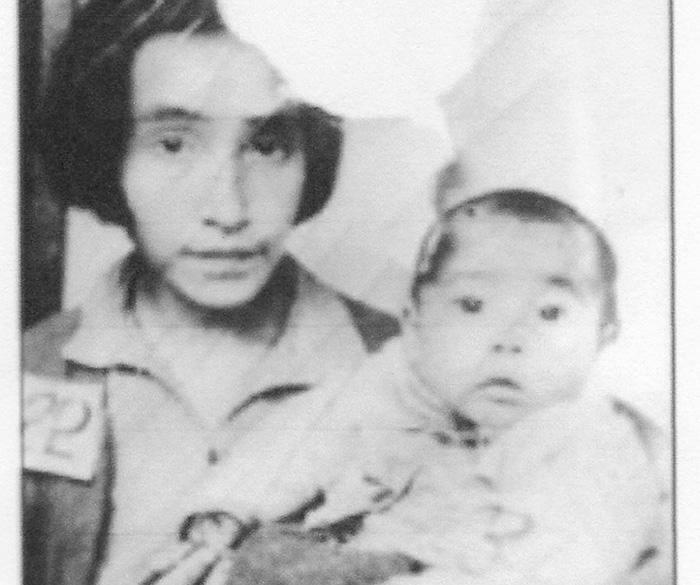 Their newborn baby died in captivity, but the couple made it back to the United States after the war. In the fall of 1945, as they journeyed from relocation camps on the West Coast towards the Aleutian Islands, anthropology professor Verne Ray arranged for them to make a recording in their native language at the University of Washington. Verne would eventually marry Dorothy Jean, which is how the records landed in her collection. Meanwhile, the Lokanins never quite made it back home—unexploded ordnance from battles on Attu rendered the island uninhabitable, so survivors spent the rest of their lives on nearby territories instead. Parascovia Lokanin and her daughter Tatiana, upon arrival at the WWII internment camp on Hokkaido Island, Japan. © Aleutian Pribilof Islands Association, Inc. The Attuan dialect is no longer spoken by anyone today, making these recordings all the more precious. When we spoke with McCartney, she had just come back from an emotional trip visiting one of the Lokanins' children, and playing them the sound files. "The human voice is so powerful. It's like smell; it brings back emotions that run deep," she comments. The Lokanin family has opted to only make the audio available to researchers, but we obtained a transcription of the recording labeled "Mourning song for deceased lover." So goes the chorus: "Don't die. Don't fall down. You and I will look after each other." To learn more about the NEDCC's work on the Attu recordings, click here. For more about the science behind IRENE, you can watch Carl Haber give a brief presentation here and read his article for Physics Today here. NEDCC also gives a play-by-play of the process here.